Well, we finally got our new fridge working. The repair man came and fixed it today. I love the fridge, it's a LG stainless steel. It has two doors on top for the fridge and there is a big drawer on the bottom for the freezer. We wern't planning on getting a new fridge till our old one went out A WEEK ago and was $600 to fix. We went grocery shopping this evening, YAY we don't have to eat pancakes without butter anymore! 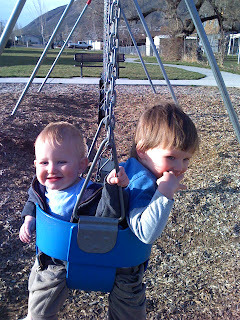 This is a picture of the boys last week at the park right by our house. They are the cutest! I thought I'd give a little Boston update today. If you know one thing about Boston it's that he is obsessed with "choo choo ains." For Christmas he got toys from Santa that weren't trains (since he already had plenty of them) after he got done unwrapping everything he just layed down next to the train under the tree and proceeded to play with that, leaving the brand new toys just sitting there not played with (Shane's thinking he will return them). Where ever we go he sees something to do with trains. White picked fence, there is an excited point and a yell, "CHOO CHOO TRACKS!" Literally a one track mind. All he ever wants to eat is pancakes although he loves chips in his sandwiches. The worry about his unquenchable thirst have been put to rest by two blood samples and a urine sample. NO diabetes! It still makes potty training very difficult, considering he has a constant stream. I've tryed many different things but have to just accept the fact we are spending a fortune in diapers. As a mother, I just can't deny him water. His speech is coming along very quickly. He says new words everyday, or maybe I'm just understanding new words every day. I have to say it is hilarious to hear what is in that little brain of his. When he was a baby Shane and I always wondered what he was thinking about, now we know, TRAINS. His favorite book is Green Eggs and Ham. As I wake up in the morning it runs through my head. He also quotes Polar Express, which is pretty funny. 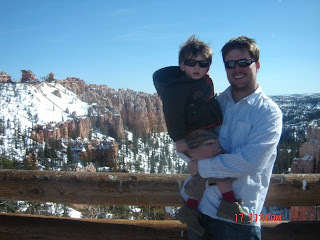 He obviously looks just like Shane, and has his temper to. I know what your thinking, Shane doesn't have a temper, put him around me or Boston and yes he does (there is something about us that really ruffles his feathers). Boston will be playing in the basement and all of a sudden you'll here screaming and big crashes. He has thrown his train and all across the room and against the wall, usually because it's not cooperating with his wishes. Sometimes he'll just go on playing without another word. I love to watch him learn and figure things out himself. He is so smart! He copy's us very well. For example; he'll put his toy of the moment down with a blanket then come to me whispering "shshshs, choo choo ninite." Then about 5 seconds later a surprised look and "choo choo crying" then runs over to the train and holds it on his chest, "choo choo, numies." It's so funny! I have to say my favorite is when he thinks it all up himself, thinking out of the box. He still is sensitive to rough housing and even PDA, he has gotten better at not getting upset when I get my hug and kisses when Shane has come home from work. Anything more than that is a disaster. Any ideas why? Jealousy? 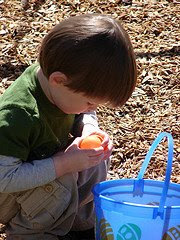 Well, here is a picture of him at our Easter egg hunt at the house. I recently heard someone say, "If you don't blog you don't exist." Well, the Vests finally got the internet! Hopefully now we can stay in better contact with all of our friends and family that feel so far away. I asked for the internet for my birthday, in hopes that I can be a better friend and family member. It's also for very selfish reasons of still having made no new friends in Utah, and feeling like I don't exist of course. This summer we will have been here for 2 years. I have worked very hard at trying to make new friends, most of the time. However, I still feel very discouraged still NO new friends. The bright side is that, I have so many amazing friends across the world that I have already made, so perhaps this (and email) at the tips of my fingers will help bring me closer to the friends I already have because I really do love and miss you all so much! So, please visit the site often and drop me a line or two, I'd love to hear from you. As soon as I figure it out I'll get pics up of the boys.